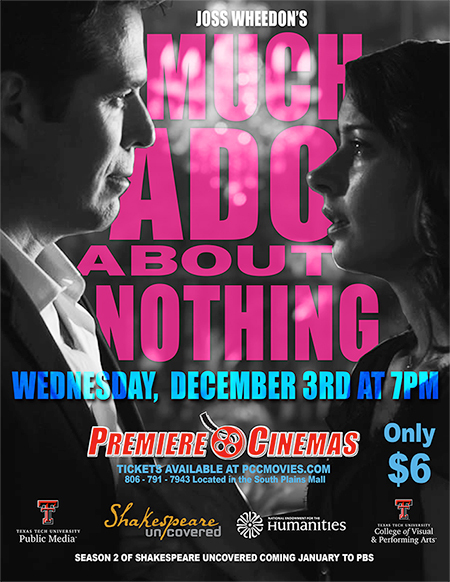 Lubbock Premiere Cinema has joined forces with PBS, Texas Tech and the National Endowment for the Humanities for a special showing of Joss Whedan's take on the Shakespearean classic "Much Ado About Nothing". The movie will show Wednesday December 3rd at 7:00 p.m. and tickets are $6.00. Tickets are available at the door, or advance tickets can be purchased at www.pccmovies.com. Movie-goers are encouraged to come early for drinks and great burgers and pizza at Premiere's Scene Bistro located in the lobby. You can also take your food and drink into the movie. Must of legal age to purchase alcholic beverages, ID required. The movie is being sponsored in part by PBS as a lead-up to their series Shakespeare Uncovered coming to PBS in January. Don't miss this special movie in a very special environment at Premiere's deluxe stadium-digital cinema at South Plains Mall in Lubbock, TX!